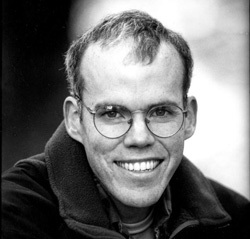 REB – Mr. McKibben you’ve been a writer for a long time, and are both publicly and critically acclaimed. Like all of the arts, it’s a difficult thing to make a living as a writer. You’ve done it successfully. And I know you’ve also done it joyfully. And I was wondering if I could ask you what your favorite experience as a writer was, or is. BM – Well that is a very difficult question, cause as you say, this is pretty much what I’ve been doing with my life since I was, I don’t know, fourteen or fifteen or something like that. And so I can answer it in many different ways. One of the things about being a writer is that it’s a solitary occupation. One of the great pleasures of my life was the few times when I’ve been it and done it with other people. The most intense version of that was the four years I spent at Harvard working on The Crimson, the newspaper. And that was really all I did when I was at Harvard. It was a six day a week newspaper and I was working there ten or twelve hours a day. For four years. With an extraordinarily tightly knit group of friends with whom I spent even the times I wasn’t working there. And that was remarkable, for me. And the central experience of working there at The Crimson was that every Sunday night they’d have editorial meetings where the entire staff, including the people who sold ads – everybody – would come and debate the editorials that would be in the paper the next week. What stands we were going to take on various issues. And everybody had a single vote, and anybody could write one, and argue it out, and amend them, and change lines, and on and on and on. And writing in that group like that was in some sense, frustrating, because you didn’t get to say exactly what you wanted all the time, but it was enormous fun. There was great pleasure in that. I’ve gone on in my life. You know, as a writer one has to mostly work on one’s own. And in a sense most of my collaborations have become far less formal. Everybody writes for a sort of small audience of people – the people they know or have in mind, that kind of thing – and I’ve had great luck to work largely in an area – “the environment” sort of largely construed – where I’ve had continued companionship from a sort of crew of people many of who are writing about some of the same things, many of whom have become great friends. Terry Tempest Williams, Rick Bass, Wendell Berry, Barry Lopez, Gary Snyder. So we don’t write together, obviously, and they’re all better writers than I am in many ways, but we all inform each other in some ongoing conversation that I very much enjoy. Previous articleLaura Schandelmeier: What is Dance?